The TNH light tank was developed by Czech Firm CKD during the 1930’s as a private venture. 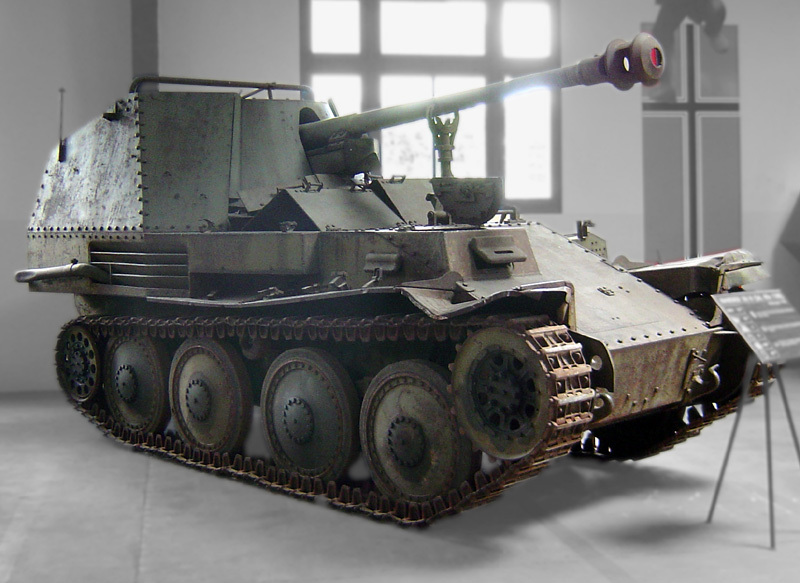 50 were exported to Iran and 90 for Sweden, however theirs were awaiting delivery and seized by Germany when it invaded Czechoslovakia and were converted to meet German requirements and re-designated the PzKpfw 38(t). After the takeover of Czechoslovakia, Germany ordered continued production of the model as it was considered an excellent tank. However the small turret of the Panzer 38(t) was incapable of carrying a gun big enough to destroy more modern tanks such as the Russian T-34 medium tank, so manufacturing of the tank version ceased in June 1942. However its chassis still provided good mobility on the battlefield, so it was decided that it would be used in the Panzerjager (tank hunter) role. 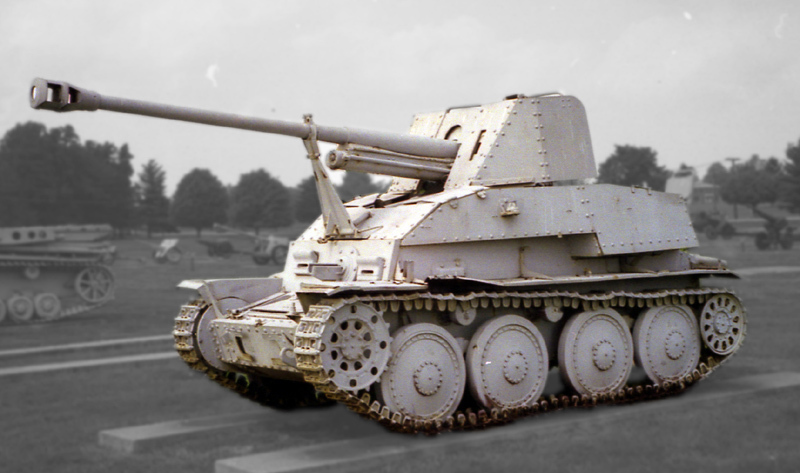 Just like the Marder II, Initially the gun used was a captured Russian 76mm anti-tank gun, which proved problematic as it relied on ammunition being captured from the Russians. A total of 344 vehicles were built from April to November 1942. Eventually an indigenous main gun was fitted, the German 75mm Pak 40/2 capable of firing at a high-velocity armour piercing rounds. 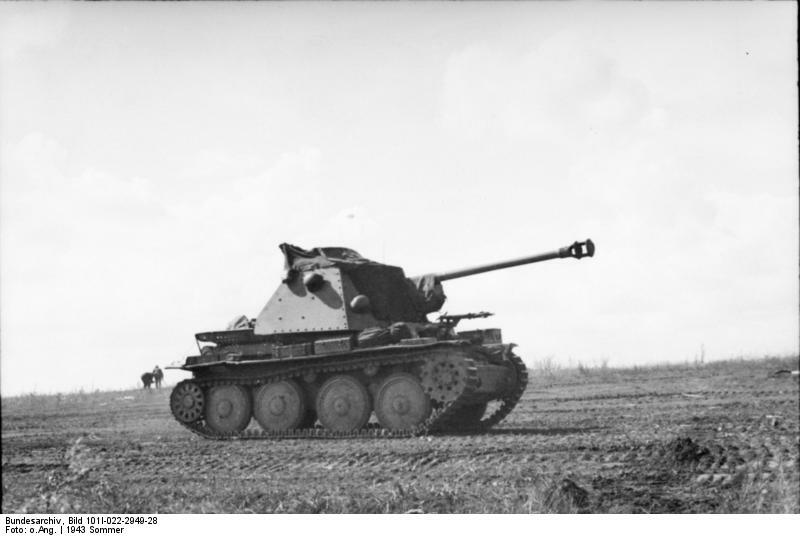 A total of 275 vehicles were built from November 1942 to April 1943 and an additional 175 vehicles were converted from Panzer 38(t)’s in 1943. A more heavily modified version of the vehicle where the engine compartment was moved to the centre of the hull, thus allowing the superstructure to be lowered and more space for the crew to operate the 75mm Pak 40/2 main gun as they weren’t sitting on the engine decks anymore. Unlike the 2 previous models the radio operator now worked in the superstructure doubling as a loader for the main gun. The easiest way to spot this model was a new larger frontal slope and the rear of the superstructure had closing doors. The vehicle also carried a 7.92mm MG was carried to protect against infantry attacks. 942 vehicles were built from May 1943 to May 1944. As the structure offered little protection for the crew from tanks, it was used by the German Army to ambush or stalk enemy tanks. It was used predominantly on the Eastern Front but saw action in the African Campaign.